The 2019 Horizon Blessing of the Fleet, Princess Ball went off without a hitch Saturday the 6th of April and many are saying it was the best one yet! Ball Chairperson Brian Morrison coordinated this spectacular event with the assistance of the Ball committee. 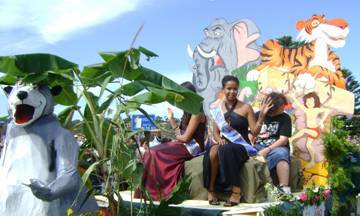 Members of this committee come from the Rotary Club of Milton Ulladulla, the Milton Ulladulla Lions Club, as well as parents in the community. A lot of time and energy goes into planning this progressive event, the Ball itself just one part of the proceedings, with Princesses and their partners attending dance classes each Sunday for over a month leading up to the Ball. Local Legend Gaven Dorrell, along with the lovely Marise Cornock, kindly donate their time to teach the young ladies and their partners several dances. The Princesses source their own sponsors, attend deportment classes with Robin Phillips and a series of interviews by a judging panel. On the night the Ulladulla Civic Centre was decorated beautifully with drapery, fairy lights, feathered table features with blue accents and a gorgeous entry arbor covered in vines. The atmosphere was electric with three hundred and twenty people expectant for the night’s processions. Twenty three Princesses and their partner’s were amongst the crowd of Dignitaries, Sponsors and Family. Radio 2ST personality Graeme Day hosted the evening with his usual nostalgic humour, having been involved in emceeing the Princess Ball since the early eighties. Ball Guests were treated to a three course meal from local Eatery Tallwood. DJ Mystergio, (Gio Puglisi) had the crowd up on the dance floor enjoying the night. 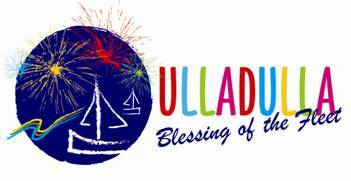 Ball Chairperson Brian Morrison announced that the Blessing of the Fleet Festival Chairperson of the past eleven years, Phil Brown would be stepping down after this year. Phil was recognised and acknowledged for the thousands of hours of community service in organising such a massive undertaking. 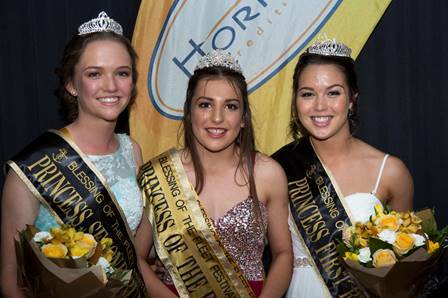 Captain Fiona Sneath, HMAS Albatross greeted each Princess, with their Partner and presented the Runners up and Winning Princess of the Fleet. Second Runner up was presented to Jet Boone. Partnered by Gaige Saunders. Sponsored by Forkliftcenter. First Runner up was awarded to Charlie Guise. Charlie was partnered by Zac Eggins and sponsored by One Agency. 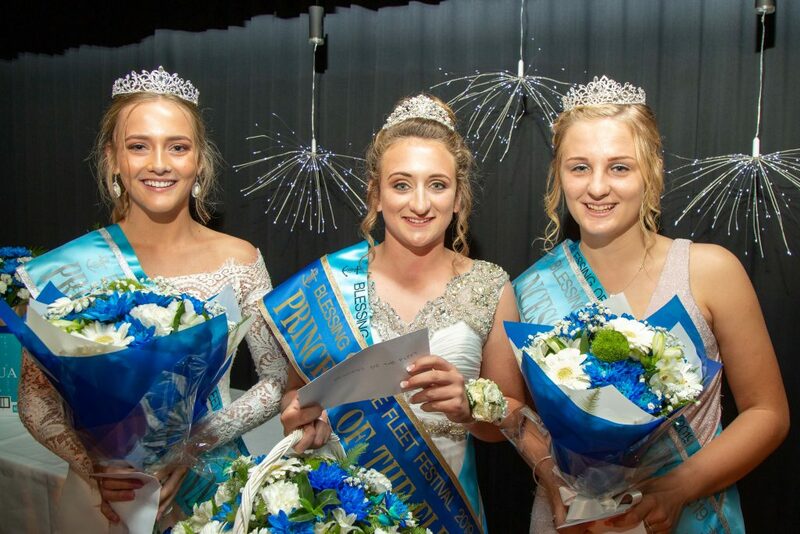 The Winning Princess, crowned the 2019 Princess of the Fleet, was Madalyn Woods. 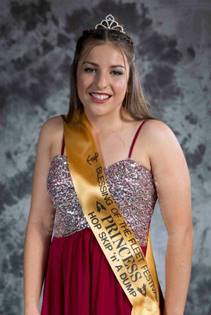 Madalyn was partnered by Blake Thistleton and sponsored by the Milton Ulladulla Ex Servos Club. 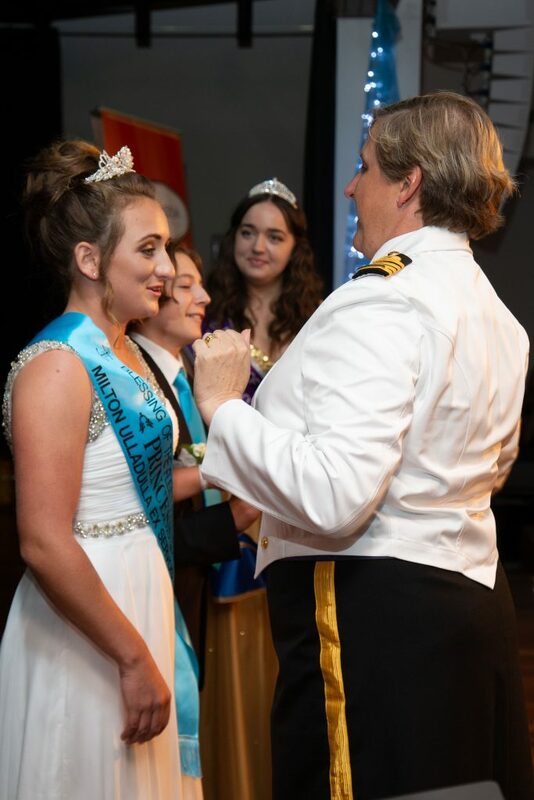 Captain Fiona Sneath Awarding Princess of the Fleet 2019 to Madalyn Woods. Image courtesy Bob Milo. 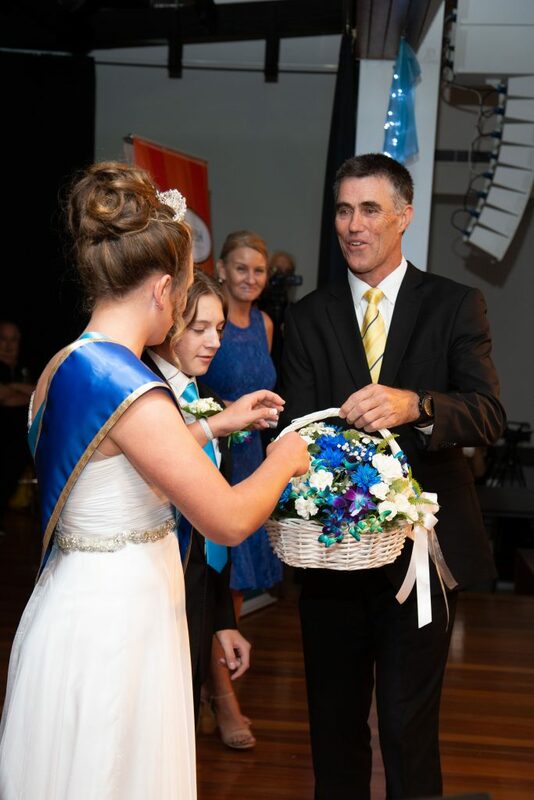 Princess Ball Sponsor Horizon Credit Union Ulladulla, manager Kevin Whitford presenting Madayln Woods with flower basket. Image courtesy Bob Milo. From left to right Charlie Guise, Madalyn Woods, Jet Boone. Image courtesy Bob Milo.